I was searching for some pink lipstick for everyday wear. Karen Murrell is New Zealand based brand that creates lipsticks with a natural base and no nasties. Recently they launched new Summer Collection ‘Summer Bouquet’ that is inspired by flowers. 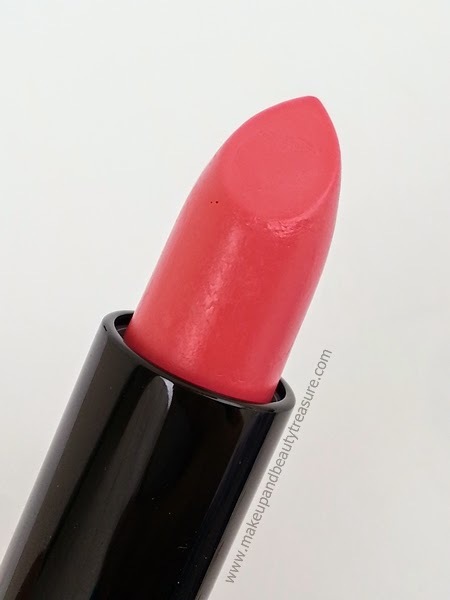 Today I am going to review Karen Murrell Summer Bouquet Lipstick in Camellia Morning which is a soft cool toned French pink shade. Karen Murrell Lipstick comes packed in a pink and black cardboard box recyclable packaging with all the information printed over it. The actual product comes in a retractable, smooth black plastic tube with the same colored pull off lid. The packaging is really very smooth and looks classy. The tube is incredibly light and looks luxurious on my vanity table and of course in my bag. It is functional and easy to use. The lid is quite tight and clicks conveniently when placing back on the lipstick. It is safe to carry the lipstick in the bag. I totally loved the logo of the brand. There is a sticker at the base of the lipstick that depicts the shade name and represents the color of the shade so it would be easy for you to identify the shade in case you are hoard many from this range. The cardboard box also depicts the color of the lipstick. I love keeping my lipstick in its pretty cardboard box. The lipstick has slightly spicy scent to it which is very mild and fades away as soon as it is applied on lips. The formula of the lipstick is very soft and smooth. The lipstick can be applied either using a lip brush or directly from the bullet. As it is sheer shade, I prefer applying it on its own. It applies easily and glides effortlessly on my lips. It doesn't get patchy or gloopy upon application. It does not feel waxy or sticky on my lips. It is quite moisturizing and I do not feel the need to apply a lip balm underneath it. If you have extremely dry lips, make sure to exfoliate your lips and apply a good lip balm underneath it. It doesn't feel heavy or greasy on my lips. It glides evenly across lips without bleeding, feathering or smudging. My lips feel soft, creamy and hydrated. The lipstick gives smooth, even and slightly pearlescent finish to my lips which I really like a lot. It doesn't accentuate the fine lines of the lips. The pigmentation of the lipstick is sheer to medium so you don’t need to be precise as you do for darker lipsticks. I need to swipe it 2-3 times to get noticeable color on my lips. If you have heavy pigmented lips then you might need few more layers. The longevity of the lipstick is quite good. It stays put on my lips for a good 5-6 hours with light meals and drinks. With heavy meals it fades off but leaves a beautiful tint behind. When I apply it and blot, reapply it and blot I find it stays for few more hours. Even when the color has worn off, my lips do not feel dry or uncomfortable. Camellia Morning is a soft cool toned French pink color with no shimmers or glitters. It provides a natural pearlescent finish to my lips. It can be worn at any time (and any day!) of the year. I also love sporting it with smokey eye looks. 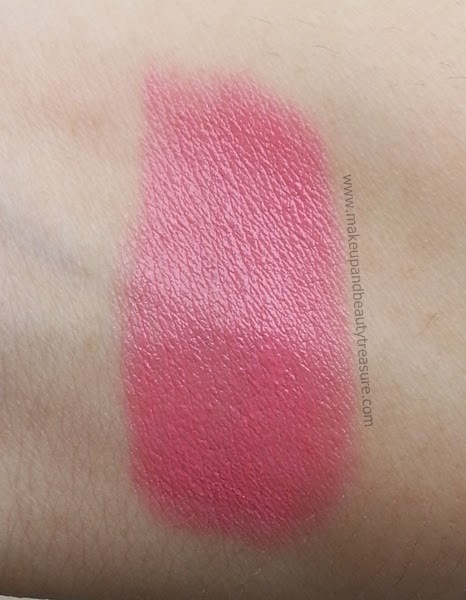 It is a perfect pink shade and would look fabulous on fair skin tones. At night parties I love topping it up with Mac Cremesheen Lip Glass in Partial to Pink. • Camellia Morning is perfect lipstick shade for summers and would look fabulous on fair and olive skin tones! All in all, I am totally in love with Karen Murrell Summer Bouquet Lipstick in Camellia Morning. I have been using it almost daily and it never fails to impress me. It brightens up my face and makes me look fresh. It feels light on my lips and does not settle into fine lines. The pigmentation and staying power is quite good. The lipstick does not contain chemicals and is all natural. Camellia Morning is a soft French pink color with pearlescent finish. It will look awesome on fair to medium skin tones. I would highly recommend it to everyone! There is a shade for everyone! 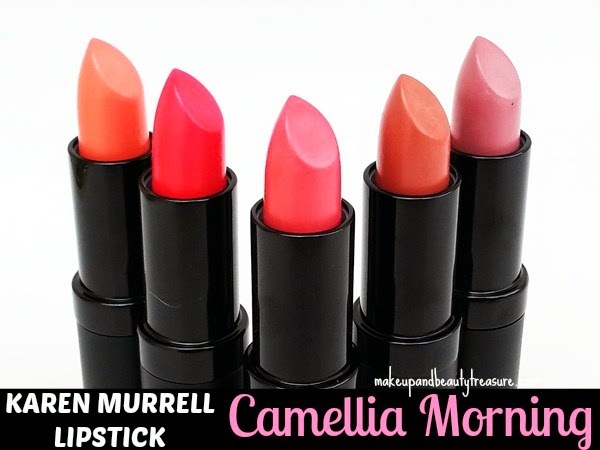 Have you tried Karen Murrell Summer Bouquet Lipsticks? How was your experience? Share in the comments section below! lovely shade and look so beautiful on you..
That's one lovely shade and it looks absolutely gorgeous on you! Such a pretty shade.. looks pretty on u Megha ! wow! loved the shade, lovely swatches Megha. Thanx Jhilmil! It would look awesome on u too! Will check it out. Thanx! I'm from the land of Karen Murrell... i.e. NZ! and they are highly raved here as they are completely natural from packaging down to the product! Very well written review Megha! Woaaaah its an honor for me to have someone interested from other country. I agree there is not a single review that does not appreciate these lipsticks! I totally adore te quality of them. Thanx so much dear! Have you tried these lipsticks?